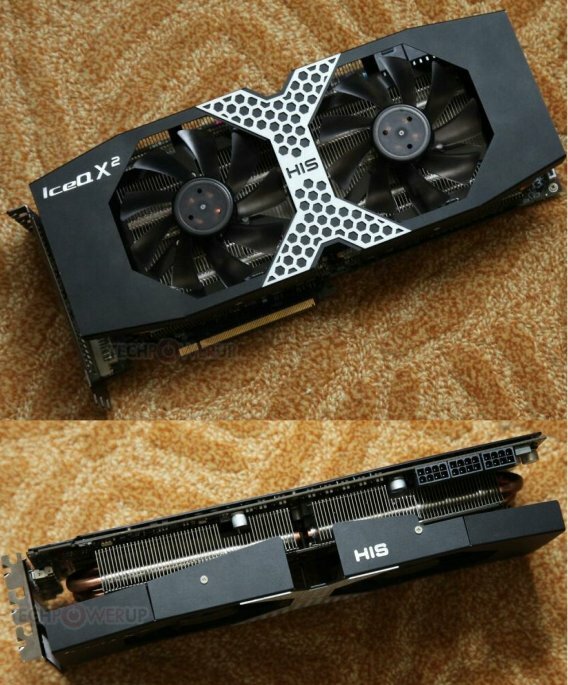 TPU published pictures of the HIS Radeon HD 7970 X2 IceQ, an upcoming graphics card that features two 28nm Tahiti GPUs. The card has a custom design, with the IceQ X2 cooling solution and three 8-pin PCIe power connectors! Like the PowerColor HD 7970 X2 Devil 13, the HIS HD 7970 X2 IceQ X2 draws power from three 8-pin PCIe power connectors, and packs two "Tahiti" GPUs with all components enabled. The two GPUs could have clock speeds higher than even single-GPU HD 7970, although HIS did not finalize them. HIS implemented a super-sized triple-slot variation of its otherwise dual-slot IceQ X2 cooler. Its card has a different display output configuration from PowerColor's, with one dual-link DVI, and four mini-DisplayPorts. Earlier today, we confirmed that PowerColor's card will reach the market only by late-July. HIS, on the other hand, wants to beat PowerColor to it, and is confident of launching the industry's first HD 7970 X2.